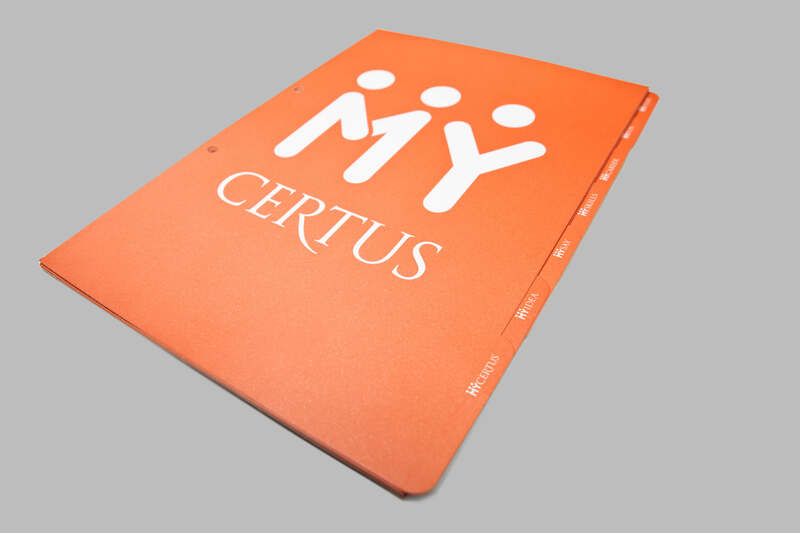 Due to the inspiration and creativity of our customers, dividers are personalised to your company needs. Our production facilities often enable us to produce a unique and personalised design at similar cost to a conventional stock divider. 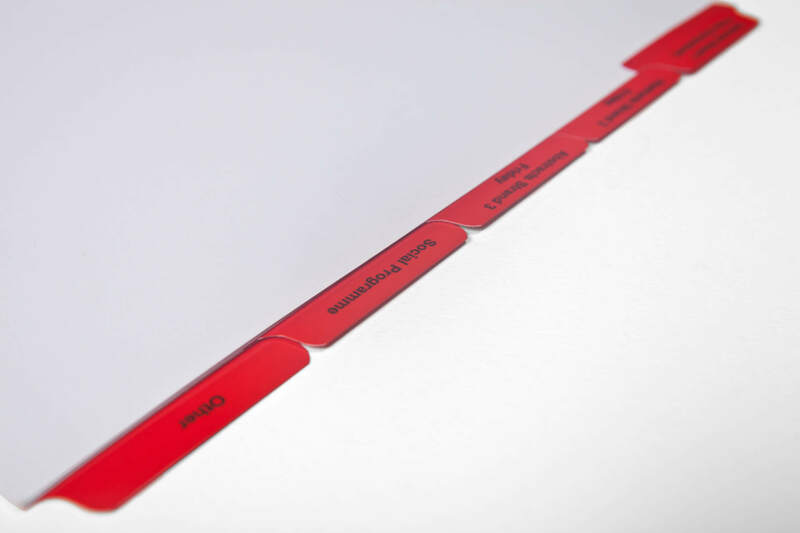 Dividers can be printed by litho or digitally. We manufacture all styles of custom made printed tabs according to your wishes. See for yourself on the following pages! Bespoke products for a very competitive price achieved through a streamlined industrial production. 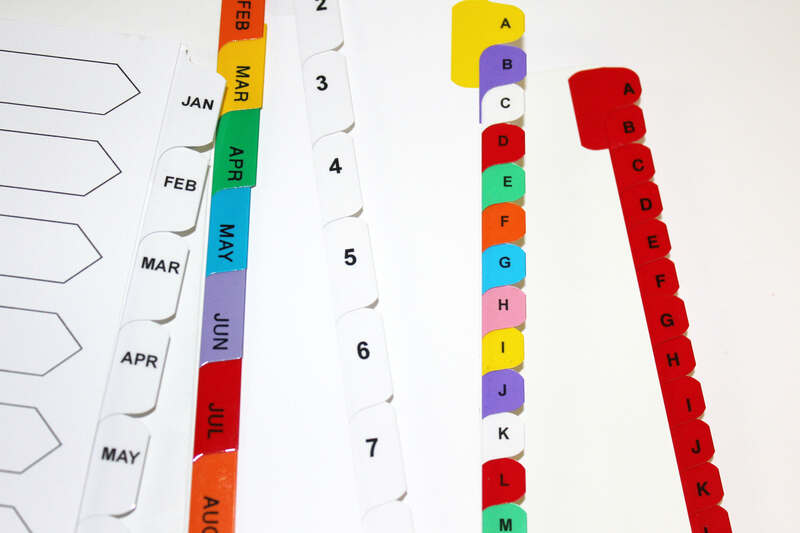 Plain or printed tabs with or without our 11 standard colours of Mylar, you decide. We can print in single or full colour, one or two sides. You can have them drilled, collated or inserted into folders. It’s up to you! We even make custom folders. We stock a large variety of coloured card and white card. We are supplied by all the paper manufacturers so that we can meet any specific demand. We carry litho card in 170, 190 and 250 gsm. Printing is possible in both digital and litho. Our automatic Mylar machines protect those parts of the divider which are subject to the most wear and tear with a clear or coloured mylar tape. 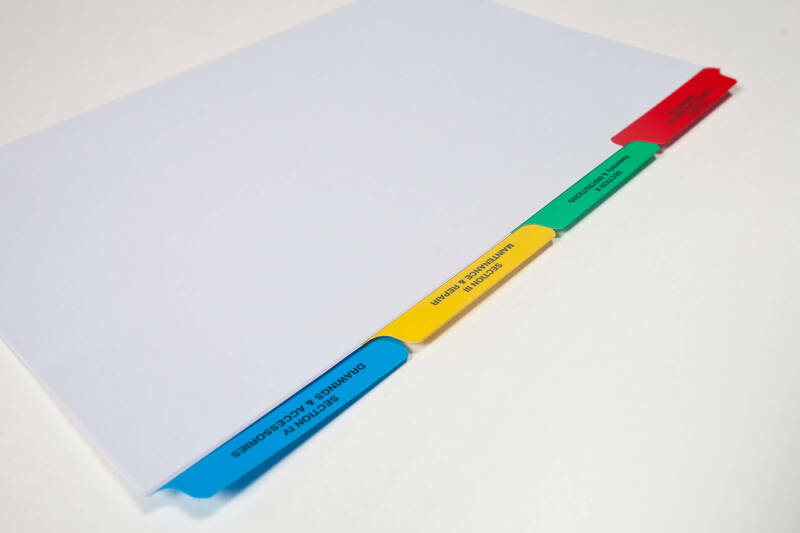 Both holes and tabs can be reinforced in this way, thus providing an attractive and durable alternative to plastic dividers. When card dividers experienced a renaissance a few years ago, the question was posed as to how their durability could be improved. We found the solution in other countries, where partially reinforced dividers - so-called Mylar dividers - have been popular for some time now and we have several machines for this production process. The information value and individuality of any divider is essentially determined by its printing. Each material and each type of divider requires a specific printing method. Shanowen Files has invested extensively in machinery and plant to meet these different demands. The core facility in our print shop with litho printing. 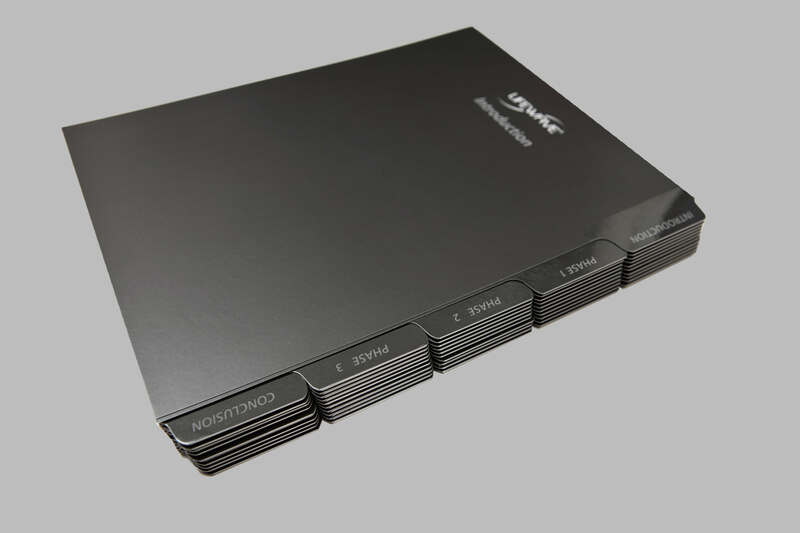 Shanowen Files is well prepared to meet most customer requirements towards the processing of their bespoke tabbed dividers, from a minimum hand-produced run of 50 sets up to large runs in fully automatic production. We utilize the many benefits of modern technology to ensure that your dividers are produced exactly as you imagine them. 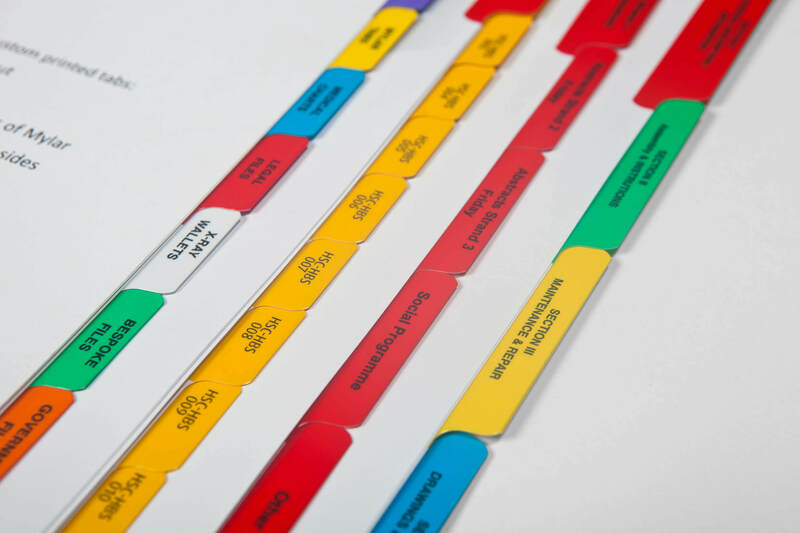 Our capable staff and our internal quality assurance system are further guarantors of customer satisfaction for your bespoke tabbed dividers. 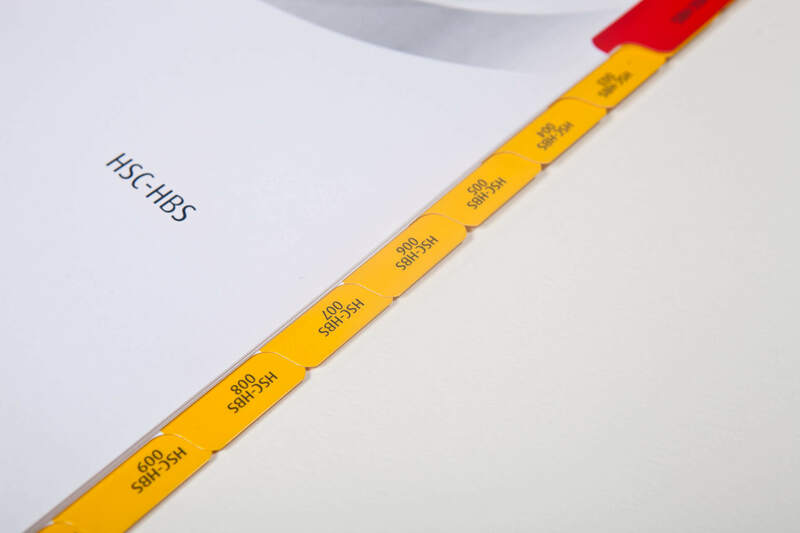 Unusual tab forms, special punching and collating of even the most complex sets of bespoke tabbed dividers and subdivides (of course also with your contents) are just a few examples of our flexibility. Moreover, we are equipped to deal with any special packaging requirements, including shrink-wrapping and banding of the finished dividers. At Shanowen Files, it all began with one semi-automatic machine, and today we produce Mylar® dividers for our customers here and abroad on three automatic scott tabbing machines. 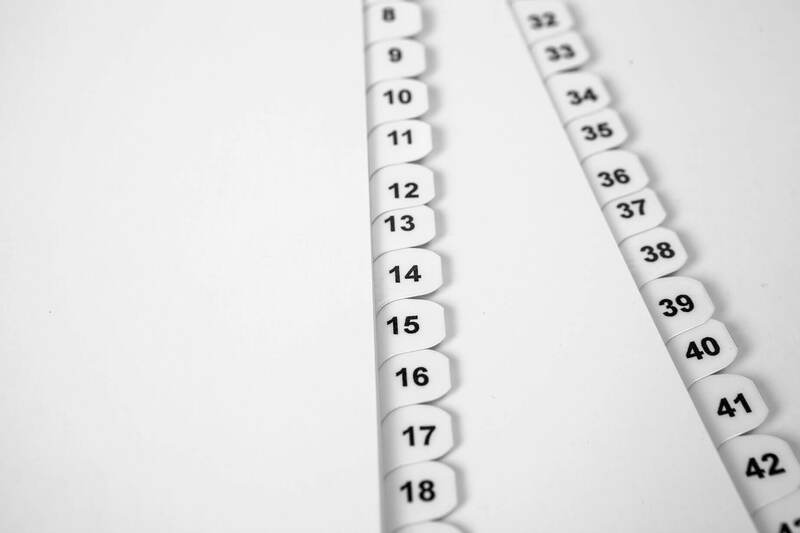 Our mylar machines process the ready-printed card dividers as follows in one operation: the tabs are reinforced with clear or coloured mylar tape, and, the hole margin, if desired, with a strip of reinforcement; finally, the divider is punched and tabbed. In this way, the most sensitive parts of the divider are protected from daily wear and tear and hence the value of the divider considerably augmented.